In today’s blog post, I am going to be sharing with you guys my review of the Lancôme Teint Idole Ultra 24Hr Foundation. This Lancôme foundation has been on my wish list for ever and a day and I am so excited to finally have it and to be reviewing it for you guys. I am sure you will already know if you have followed my blog for quite a while, that I have a wish list. Whenever I see anything that I want to pick up either makeup, fashion or even tech items, they will go on my wish list until I can get around to trying them out for myself. 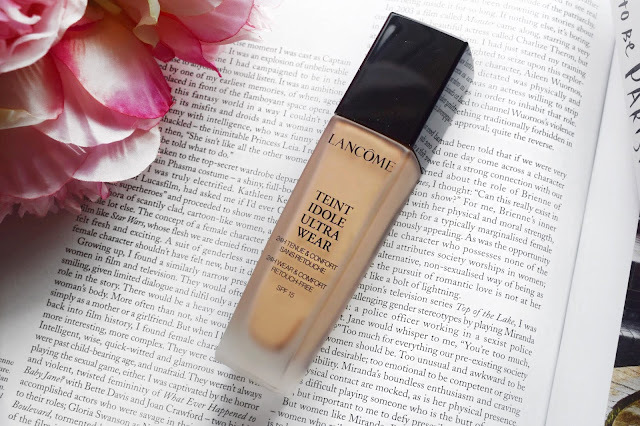 This Lancôme Idole Foundation has been on my wish list for such a long time, it could even be going back years now, so I am so excited to finally have this because it really is such an incredible foundation and I am in love. I think the reason why I didn’t try out this Lancôme Idole Foundation any sooner is because I thought it would die a death. Whenever I went to buy this foundation in the past, there was always something new and exciting that I decided to try out instead. In the end, I decided to finally go ahead and buy this foundation because I feel like over the past year, Lancôme have had a revival of sorts and they are up there with some of the big popular brands. I know that they have always been an incredibly popular brand, but now they are getting involved with PR and blogger trips, so their products really are being pushed out their hell of a lot more by really influential people. The first thing that I want to talk about in this review is the packaging. I know that some people think that I am absolutely crazy for talking about the packaging as part of my review, but I think that the packaging is actually super important. Even though I am well aware that it is what’s inside the bottle that really matters, if I am paying for a high-end makeup item, I at least want the packaging to reflect that. With this Lancôme Idole Foundation, I do really love the packaging. It is a glass bottle, which isn’t ideal for travelling, but it is stunning for an everyday basis. It has a pump which is a necessity in my eyes, I tend to discard foundations without pumps. Then, when it comes to the frosted glass, I just think that it is to die for. Like I said, I know that it is only a small thing, but I just appreciate nice packaging… but that might just be the blogger in me thinking about photography! Up next, I want to talk about the consistency of the product. When it comes to reviewing any foundation, I think that you have to talk about the consistency of the product because I know that can be very make or break for any product. When I pump this out onto the back of my hand, it is somewhere in between thin and thick. Consistency wise, I think this is pretty similar to the Nars Sheer Glow. When I pump this out, it stays in place and it isn’t overly running. At the same time, it isn’t a thick foundation like the Kat Von D Lock It Tattoo Foundation. 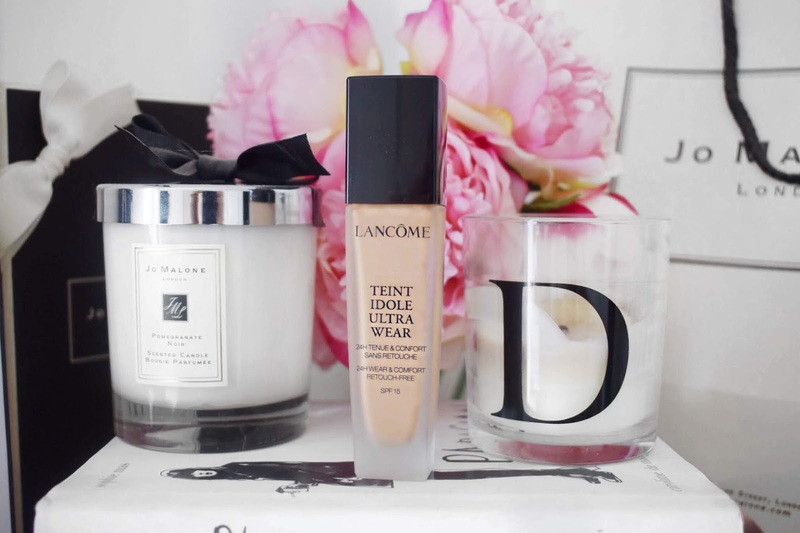 Because of the consistency, I think that this Lancôme Teint Idole Ultra Foundation is incredibly easy to work with and it really does make it a pleasure for using day in and day out. 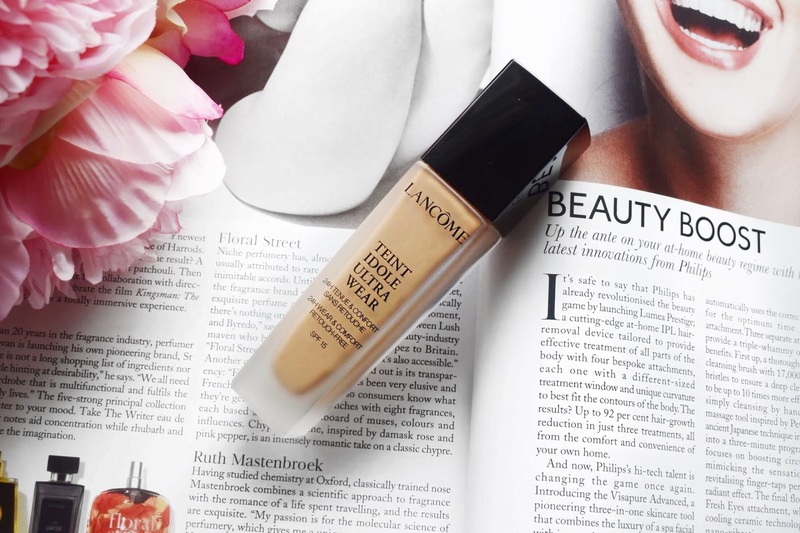 It is time to talk about one of the main points about this Lancôme foundation and that is the stunning coverage. In a nutshell, this is a full coverage liquid foundation. If I pop a small amount of this foundation onto the tip of my finger and I swatch it across my arm, I get a line of complete pigment and everything is completely covered. I know that when I use this foundation that my freckles, blemishes and dark circles are not going to stand a chance of peaking through. Coverage wise, I would say that this reminds me to the Hourglass Vanish Stick Foundation. 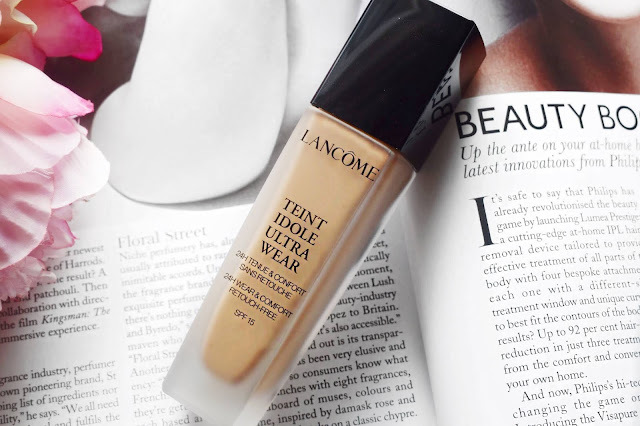 Even though the Hourglass is a stick product, it gives a very full coverage that can be built up to be extreme coverage, or it can be sheered out using a damp Beauty Blender to be very natural, much like the Lancôme Idole foundation. Even though this foundation does have an absolutely incredibly level of pigmentation to the product, it is still incredibly easy to work with. Normally when you have a foundation that is as full coverage as this one is, you have to sacrifice certain aspects, such as the blendability of the product. I have been using this product for quite some time and each and every time I have reached for this, it has looked stunning on the skin and I am obsessed with it. I have used my fingers, brushes and even a sponge to apply this and no matter what I use, the product works into the skin really easily and it looks flawless on the skin! This Lancôme Teint Idole Ultra 24Hr Foundation set me back around £32 when I picked it up from House of Fraser and I have to admit that I am more than happy to pay that amount for a foundation of this incredible quality. I know that this is going to be a permanent item in my makeup collection for a very long time to come because it makes my skin look absolutely phenomenal. Make sure to leave me a comment and let me know if you have tried this product out for yourself and tell me what you thought about it! Ooh you've absolutely sold me on this- I love anything full coverage and I completely agree with you about the importance of packaging. This is so sleek and gorgeous! I just cannot stop using it, I am in love! Packaging is a definite part of any review, sometimes I find with products the packaging actually makes using it more difficult. I personally adore this foundation! I love how natural it looks yet it lasts so well. This has quickly become a holy grail for me, though I do wish it didn't have a fragance. Fragance in foundation isn't actually the best in our skin, considering this one smells almost like perfume. I get what you mean but because I mix up the ones that I use so much, it doesn't bother me all that much! oh my i need a new foundion so bad!! this sounds amazing i love this !!! I am obsessed with it and cannot stop using it! I just think that if I am wearing foundation, I may as well just really go for it! I also wanted to purchase this foundation but after trying it out at the counter I found that this foundation was absolutely nothing for dry skin. It shows every dry area on my face and makes lines caused by dryness more visible. Still, I believe that it´s a great product for the girls with combo skin. I can imagine that it isn't amazing for dry skin, I would have to pair it with a hydrating primer! I cannot wait to try out more by Lancome! The packaging is really important in any face product, there are so many amazing products out there but with poor packaging that make us not keen on buying them. It is just the most stunning bottle! Definitely one of the very very BEST foundations on the market. It baffles me this foundation doesn’t get more buzz because it’s just a miracle product. I am so obsessed with it, I wish I had tried it out sooner! Me too, that would be an absolute dream! I wore this one on my engagement day and I was so surprised with how it held up... Beautiful finish and really long wearing. ..